At Taste the Cracklin we provide a number of different hog roast services including hog roast catering and hog roast machine hire. Our hog roast catering is one of the very best services, we source all food locally which helps us to keep a small carbon foot print, it also allows us to bring the freshest foods to your event which will then be prepared and cooked on-site for you and your guests to enjoy. When it comes to a Taste the Cracklin hog roast Stratford Upon Avon has one of the very best teams, who will be able to answer any questions which you may have. 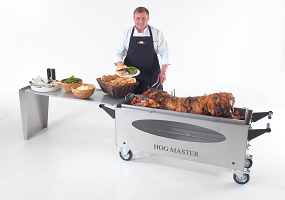 Hiring one of our specialist hog roast machines allows you to take control and wow your guests by cooking them one of the best meals they’ve ever had. Our chefs will show you how to use the hog roast machine when it is delivered to you and they will also leave you with an instructional DVD. If you follow all instructions then you shouldn’t have any problems cooking with one of our hog roast machines. When it comes to finding a hog roast Stratford Upon Avon hosts one of our expert teams who will provide you with an excellent service. So give us a call today, or fill in the form on the website and find out how Taste the Cracklin can help you with your event.